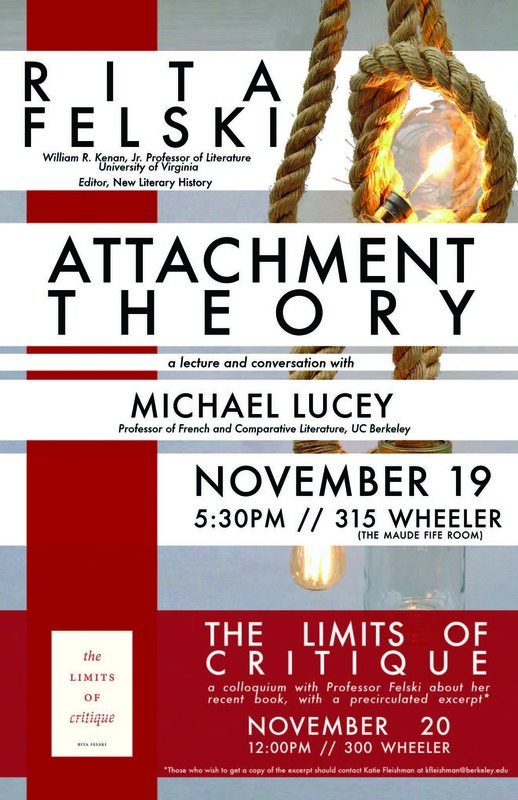 Michael Lucey, Professor of French and Comparative Literature at UC Berkeley and member of the Representations editorial board, will participate in a conversation with Rita Felski, William R. Kenan Professor of English at the University of Virginia and editor of New Literary History, on “Attachment Theory,” following Felski’s lecture on the topic. 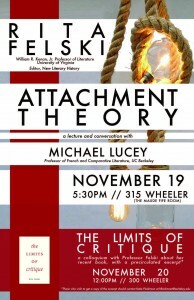 The event will take place on Thursday, November 19 at 5:30 p.m., in the Maude Fife Room (315 Wheeler Hall) at UC Berkeley. 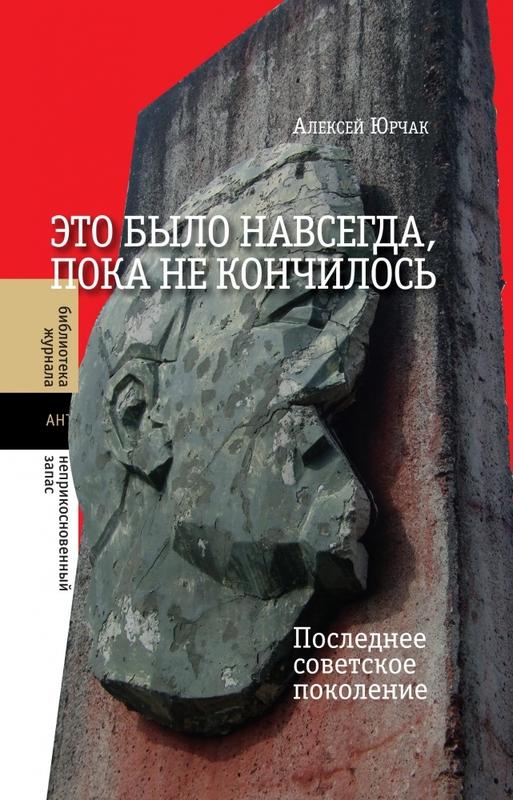 Felski will also participate in a colloquium the following day on her recent book, The Limits of Critique, which engages in ongoing debates about modes of reading in which Representations has been central (see Representations 108, “The Way We Read Now” [Fall 2009]). The colloquium will take place in 300 Wheeler Hall on Friday, November 20 from 12-2 p.m. In the wake of New Historicism, eight music scholars reflect on the recent tendency to use objets trouvés and historical micronarratives for interpretation. The editors of the forum, Nicholas Mathew and Mary Ann Smart, introduce the thread of the quirk historicist phenomenon and contemplate its implications. Jean Pierre Louis Laurent Houël: ‘‘Les eléphants représentes dans l’instant de premières caresses qu’ils se sont faites après qu’on leur a fait entendre de la musique,” in Histoire Naturelle des deux Elephants, male et femelle, du Muséum de Paris (Paris, 1803). 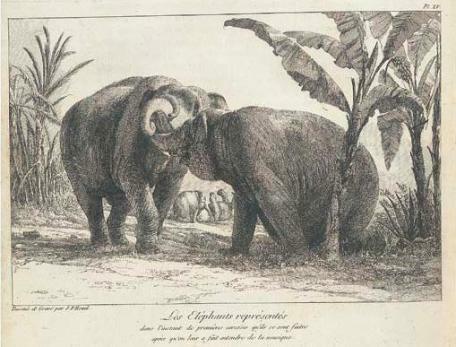 Despite a suffix that suggests kinship with taxonomic enterprises such as zoology or the earliest phases of anthropology, musicology may rank as one of the most permissive of humanistic fields. In journals and at conferences, philological research and source studies rub shoulders with work on the philosophy of music, close readings, reception history, and microhistory. Yet, as in literary studies, one central question has troubled the field for at least a quarter-century: that of the status of the “texts” (musical works, as notated or performed) whose interpretation and explanation traditionally anchored much musicological writing. As both the canon of works that merited this type of attention and the analytical tools used to explicate them were destabilized, scholarly energies turned toward narrating historical accounts of musical environments. In the wake of this suspicion of close reading, many musicologists became collectors of curiosities, assembling and scrutinizing disparate objects, events, and documents in order to understand how past communities of listeners and practitioners used music, why they created and cared about the kinds of music they did. Before this collecting impulse took hold, history often meant “context.” Musical works could be enriched, but at the same time shown to be functional and contingent, by accounts that placed them in ready-made historical frames supplied by the locations in which art was produced or by big-picture histories—the French Revolution, the Third Reich, the Napoleonic Wars. And like most such cross-disciplinary borrowings, the imported concepts were sometimes flattened out, as if they had passed through the brain’s “abstract thought” region, as imagined in the Pixar movie Inside Out. As the kinds of history practiced by music historians have become more fine-grained and more material, there is a temptation to look down on earlier approaches as schematic or simplistic; but it is worth remembering that those contextual dyads (“music and . . . ”) were welcome and necessary excuses to talk about music—even instrumental music, symphonies and the like—in relation to categories such as gender, race, and nation, whose admission into musicological thought was long overdue. NICHOLAS MATHEW is Associate Professor of Music at the University of California, Berkeley. He is the author of Political Beethoven (Cambridge, 2013) and co-editor, with Benjamin Walton, of the collection The Invention of Beethoven and Rossini. MARY ANN SMART also teaches in the Music Department of UC Berkeley. She is the author of Mimomania: Music and Gesture in Nineteenth-Century Opera and editor of Siren Songs: Representations of Gender and Sexuality in Opera. Her new book, Waiting for Verdi, will be published by the University of California Press in 2016.